When Manoucher Etminan, creator of Manoucher Bread, came to Canada in 1980, he had one vision: to create a future for himself and his only daughter. With no prior knowledge in bread making or the food industry, he set a goal of filling a void in the specialty bread market in Toronto. With no money or family support, Manoucher made a promise to himself to produce the most authentic handmade breads using only the finest, purest ingredients. 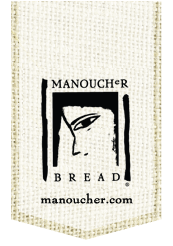 For over three decades, Manoucher Breads have been enjoyed by loyal customers around the world, praised by well known food critics, have won international bakery awards and requested by specialty food shops, restaurants and hotels globally. In addition to the many accolades Manoucher has received, the breads have become the chosen platform for international airline chefs to showcase some of their creations. A simple sandwich becomes a work of art for the discerning passenger on premium airlines. Manoucher Breads elevate the ordinary into the extraordinary and the inspiration which transforms any meal.Thanks to British Airways among other international companies, Manoucher Breads has been enjoyed by passengers on many Premium Airlines. Our unique Flash Freezing Technology and recipes allow Manoucher Breads to retain their moisture, texture and flavour as though they are fresh once thawed. Indeed, it is the only bread that “stays fresh 35,000 ft in the air” without the use of chemicals, preservatives or any artificial ingredients.